I was on the server over the last hour. While I saw that overload message popping up again two or three times, I could not spot any "errative behaviour". Then again, I am more focused on hunting tanks. Apart from that I haven't enjoyed myself that much for quite some time. Over the time I was flying there were new guys popping in and out .. 'it was a hoot', as Gubi would've said .. Thanks for the report Skylla. Indeed the Server was crowded. We've had 20 players on the 5PM mission and 35 on the 7:30PM one. This would probably have continued, but unfortunately the Pe-2 ser.87 blister turret bug isn't the only one, since this is solved now (by workaround) but DServer.exe crashed on 8:13PM nevertheless (all times are GMT). I'll try to get a watchdog done that will restart the server in case of such crashes. I was on the server when it crashed. The mission went down fine with 8-9 players on both sides. When the mission ended, one half of the players exited, the other half stayed (including me), and the crash occured during or after the loading of the next mission. I made a few track recordings on FAC and on Coconot's Normal later on, and reloading those tracks takes ages. Seems normal until the progress bar reaches 100%, but it halts there on the splash screen for minutes before it transfers to the cockpit. If you could upload the tracks, we could compare results. At most, the server will now be offline for ~30 seconds in case of such crashes. Hey guys, I really enjoy your server! A lot of times I see it is not online, like right now. Is there a reason for that? The reason for not being online is the current instability of DServer.exe. We're trying to fight this with a watchdog that automatically restarts the server in case of such crashes, but unfortunately that crash shows so many facets that it's really hard to cover all of them. Thanks for replying Storebror! Should I report every time I see the server is down? If so, where? Thanks for your effort Erab100. You can report here in this thread for the time being. Skylla and me can restart the server if it locks up again. Right now it's up again. 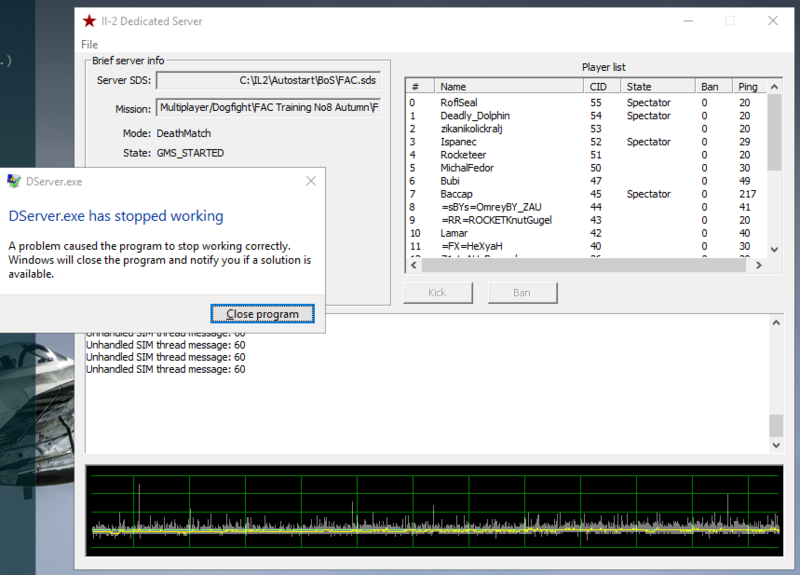 Server was restarted at 9:19 AM local time, at 3:37:53 PM local time DServer.exe crashed again but the Watchdog was able to terminate the hanging process, so that at 3:28:06 PM local time, 13 seconds after crashing, the server was back up again. Of course it's still disturbing for the players who were online at that time, but that's the best we can do at the moment until the devs finally get the issues sorted. Server's down again, did it crash? This time it looks like DServer took the whole Server OS down with it.